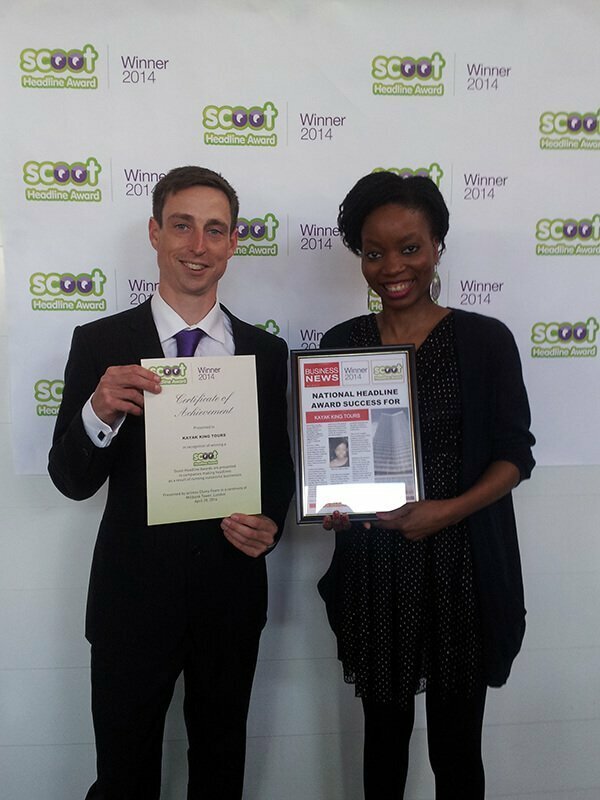 Scoot Headline Award in the national campaign to find Britain’s most successful companies. We’re very proud to announce that Kayak-King has been crowned the best company in Wales by national business directory Scoot, in the Scoot National Headline Awards held on Monday 28th April. The annual SCOOT Awards is one of the most prestigious business awards in the UK that recognises and rewards the successes and achievements of British businesses, large and small. Actress and TV personality Ebony Feare presented the award to Ant Goddard, managing director of Kayak-King. On Monday, we travelled to the awards ceremony, held at Millbank Tower in London, having been shortlisted for the award earlier in the year. The event was attended by successful companies from all over the UK, ranging from small independent businesses such as hairdressers and letting agencies to large national companies. As well as picking up our trophy and certificate which now take pride of place in the Kayak-King office, we made some great contacts at the event, some of whom we are planning to work within the near future – so all in all, it was a great day out! We’d like to thank Scoot for picking us as winners of the award, and we hope that this is the first of many awards for Kayak-King. Kayak-King offers Kayaking tours along the Pembrokeshire coast. With clean air and crystal clear waters Pembrokeshire is a haven for kayaking. The rocky arches, towering sea cliffs and rare marine life are just a few of the delights just waiting to be explored on the Pembrokeshire Coast National Park. To experience our award-winning tours for yourself, contact us today on 07967 01 02 03 or email info@Kayak-King.com.